Do you find yourself hiding your healthy smile? Is it because, although your teeth and gums are in good shape, you have some discoloration? 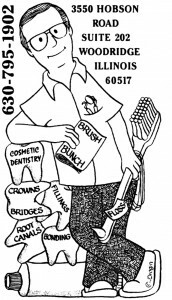 If so, Thomas J. Machnowski DDS in Woodbridge, IL is a cosmetic dentist offering teeth whitening treatments. As your preferred dentist in Woodbridge, IL, we understand how important teeth whitening is, and how it can be something that does much more than enhance the good looks of a smile. After all, tooth whitening is a simple, fast, and affordable way to boost your confidence and self-esteem. When you feel no hesitation to open your mouth and speak or smile when you meet someone, it makes a big difference. This sort of behavior can affect your career and your life in general. It is why whitening is as important in our cosmetic dentistry as other treatments. How is teeth whitening done? Patients meet with us and we perform a checkup and cleaning if needed. If we find that some general or preventative treatment is necessary, we make sure this is taken care of too. After all, it is unwise to use whitening if the teeth themselves are compromised. We rely on a special in-office teeth whitening system that uses a light activated bleaching agent. We carefully apply this to your teeth and then expose them to the light fixture. In less than an hour’s time, your teeth will have lightened by several degrees. Before we begin, we use a chart to note the color of your teeth, and when done we use the same chart to measure the amount of whitening that has occurred. We also make at-home treatments available. For this approach, we would create customized dental trays based on molds of your teeth. This would allow you to safely apply the whitening agent without any difficulties or mess. You would wear the trays for a set amount of time, and get effective teeth whitening in this way as well, or you can use this approach to touch up work you had done in our office. Patients who use whitening are also consulted about lifestyle habits that may contribute to the issue. If you smoke, drink staining beverages like colas, red wine, coffee, or tea, or you eat a diet high in sugar, we advise you to change these habits as they contribute to the staining. If you have additional questions about teeth whitening, or about any of the other treatments mentioned here, give us a call at our Woodridge, IL office at 630-795-1902. You can also use our online contact form and one of our staff will get back to you promptly.